Mexican food is a favorite at our house, and we are eating something with taco seasoning at least once a week. 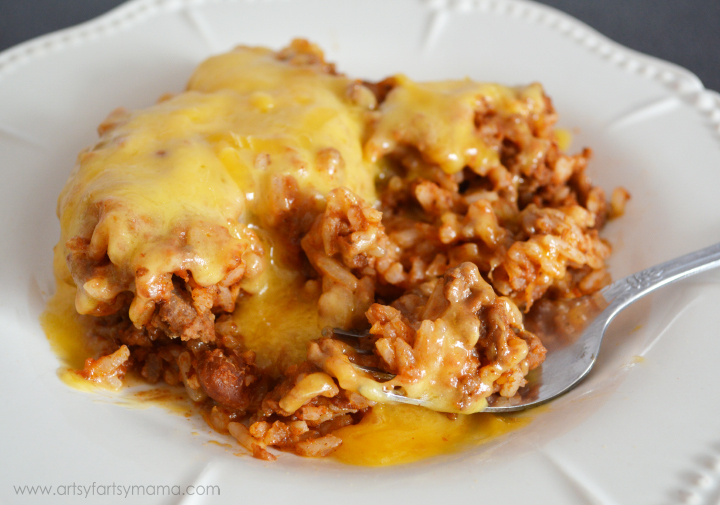 This easy beef enchilada casserole is an easier and quicker version of my Enchilada Lasagna recipe with a few adjustments that has turned into one of my husband's new favorite dishes. Cook ground beef, drain and add packet of taco seasoning. Stir until all the beef is covered. Stir in enchilada sauce and refried beans. Keep stirring over medium-low heat until combined. Pour meat/bean mixture into a 9x13 pan* and add cooked rice. Carefully stir until combined and make sure all the rice is covered with sauce. Add in 1/2-1 cup of cheese and mix in. Then spread the mixture evenly in the pan and top with remaining cheese. Cover the casserole with foil and bake at 350º for 15-30 minutes or until cheese has melted. Top with favorite taco/enchilada toppings and enjoy! *If you have a large enough pan, you could easily make this into a one-pot dish and take out the baking step. Just mix all the ingredients together in the pan, and top with cheese. Place the lid on the pan and heat on low (or turn off) until cheese on top is melted. I think I'll be making this for dinner tonight and maybe serve it in some tortillas :) Thanks! This looks so yummy! We are huge Mexican food fans too so I'm sure this won't last long when I make it!